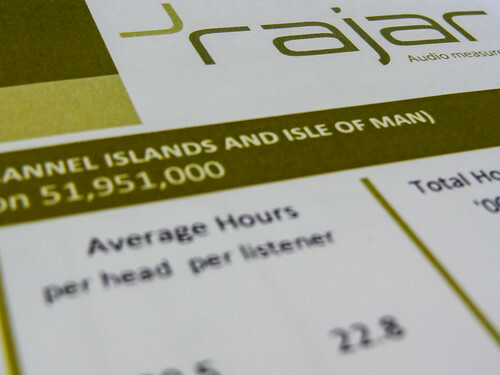 It’s May, and that means it’s time for another round of radio numbers and RAJAR. I’m not sure that there’s a completely compelling over-arching story this time around. Nationally, Radio 1 has slipped a little in reach and hours, but Radio 2 has done well with a decent increase in reach to nearly 14.6m adults, and a record number of hours – nearly 179m a week. Radio 2 listeners are now listening for 12.3 hours a week, which is only matched nationally by Radio 4. Although in some local markets, that number can be met or exceeded – for example LBC 97.3’s audience listen for 11.6 hours a week while BBC services in Northampton and Guernsey get 12.7 hours a week from their listeners. Island FM 104.7 – also in Guernsey – does the best in the land with an average of 14.6 hours a week per listener. They clearly love their radio in the Channel Islands! But back to the national picture for a moment. Radio 3 has dropped below 2m listeners for the first time in nearly a couple of years, and Radio 4 has dropped back half a million or so listeners. Five Live has seen its audience grow in reach and hours, while Talksport has seen a modest increase in reach and a modest fall in hours. My own employer, Absolute Radio, is very pleased to have a shade under 3m listeners across the network, a high for the station group in nearly ten years. The main service has also seen a small gain in reach, although there’s a dip in hours. Classic FM has had a decent reach and hours gain, although it has a way to go to achieve the listening it had a year ago. The phoenix that is BBC 6 Music has had another record audience in reach terms, with just short of 1.5m listeners, but its listening hours have dropped back a little. BBC Radio 4 Extra has seen its figures fall back some, as has Radio 1 Xtra. Asian Network has seen its reach grow but hours fall as the BBC Trust confirms its budget cuts won’t be as deep as previously envisioned. And as BBC local services in England learn that they’ll be able to keep their afternoon programmes, BBC Local Radio in England has grown by 2.5% and BBC Local radio overall has grown by 3% in terms of reach. The bigger commercial groups all fell back a little, with GMG losing 2.5% of their hours and Global being down 2.1%. TIML, owners of Absolute Radio bucked the trend putting on 11.3% in hours with the launch of Absolute Radio 60s and Absolute Radio 70s. While in the Midlands, Orion has grown by 1.2%. Nationally, the Kiss network has had a good quarter, growing decent reach and hours, while Magic network has lost some reach, but gained hours. At Global, Capital’s results nationally are a little disappointing with flat reach, but a 5% fall in hours. The Heart Network shows a modest reach increase, and a small fall in hours. But LBC performs strongly though with a 2.5% increase in reach, and close to 5% increase in hours. There is some really good news amongst digital stations. Absolute 80s has a decent 3.5% increase in reach, but a 17% increase in hours, while Absolute Classic Rock also performed strongly in hours reaching a new record high, with a small reach gain. Jazz FM will be very pleased with a 10% increase in reach, and a 27% increase in hours – a record high in its current national incarnation. But Planet Rock has done even better, with record reach and hours figures. It now has 861,000 listeners, and approaching 10m hours. And the perhaps sometimes unloved Chill has done very well. It’s equalled its biggest ever reach of 229,000, as well as its biggest ever hours! In London, Capital maintains its position as number one in reach amongst the commercial stations, with Magic, Kiss and Heart all closely packed a couple of hundred thousand listeners behind. But a 9% decrease in hours for Capital, and a 9% increase for Magic, means that the latter is now number one in hours terms. Smooth has done well in London, bouncing back to somewhere closer to where it was, having taken quite a tumble last time around. But Gold and particularly Xfm in London have had disappointing results, leaving the latter with its fewest ever hours. Absolute Radio has had a disappointing set of numbers in London too, while BBC London has seen an increase in reach and hours. Digital listening has seen a small gain this quarter, with 29.2% of listening now digital. And 45.1% of the population listen to at least some of their radio via a digital mechanism – a figure that rises to closer to 50% if you just consider people who actually listen to the radio. RAJAR diaries changed their wording subtly this quarter to record internet listening. Diarists used to see the word “Internet” whereas they now see “Online/Apps”, and that might be partly behind why listening via that platform has increased from 3.4% to 3.9% this quarter – a record high. With the growth of RadioPlayer, and generally increased usage of station apps, that movement shouldn’t be a surprise. At Absolute Radio, we’re now at 77.3% of listening via a digital platform, and even if you only consider the main Absolute Radio service which is also available on AM nationally, and FM in London, it’s still at 54.7% up from 51.4% last quarter. But overall, one might have hoped or expected a slightly bigger jump in a post-Christmas period. As you can see from the chart below, there’s normally a Q1 jump. I suspect that another quarter or so of RAJAR might see things change a little, but we’ll have to wait and see. In an attempt to reduce the number of charts I include in these summaries, here’s just a single digital platform listening breakdown. It clearly demonstrates how digital Absolute Radio is, but also highlights Five Live and Radio 3 being ahead of the curve in digital terms. However, I have again updated my Hans Rosling inspired national services RAJAR tool. But don’t use this small version, use the full screen version full visibility. And be sure to read the notes I put together when I first made this. They still apply, and highlight the strengths and weaknesses of it. Absolute Radio’s take on the figures can be found here. Source: RAJAR/Ipsos-MORI/RSMB, period ending December 2011, adults 15+.